BAT - BLOG : BATMAN TOYS and COLLECTIBLES: Costumed #BATMAN Fan Gets Political in Brazil! 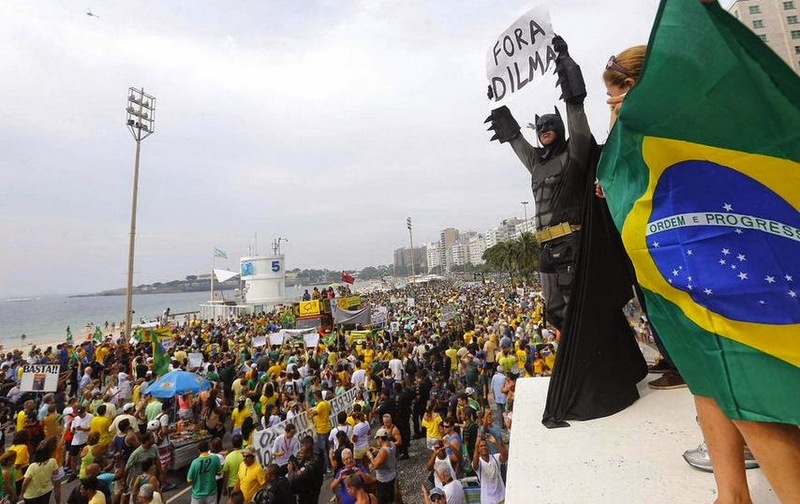 Costumed #BATMAN Fan Gets Political in Brazil! Check out this random photo I came across the other day. It's some sort of protest against something in Brazil and I had no idea what it meant. So, I asked some Brazilian friends on FACEBOOK to translate it for me and here's what they said. It's a protest against Brazil's current President, Dilma Rousseff. She is the first woman to hold the office. Many people want her impeached, including this guy dressed as Batman. The sign he is holding roughly translates to the phrase, "DILMA OUT! ".